19 days left! 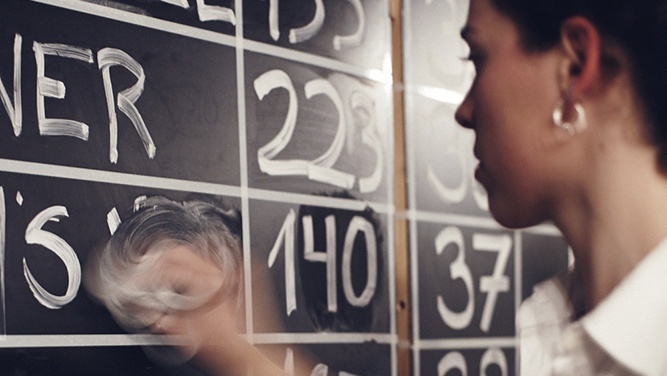 The fifth edition Barcelona Beer Festival is very close, and the whole organising team is very busy. 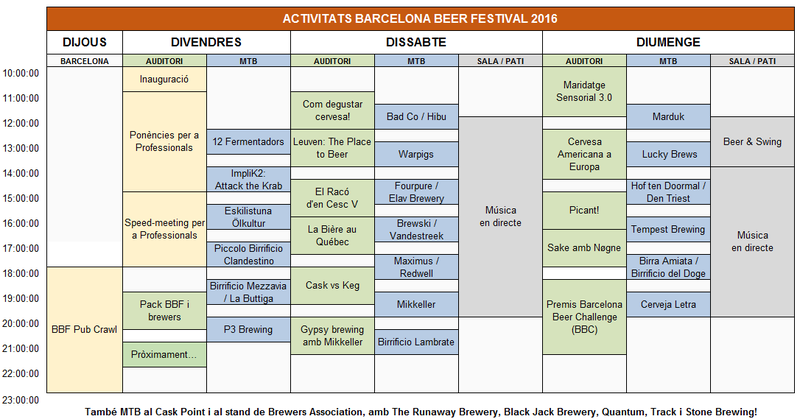 We are less than three weeks away from hearing the bells tirelessly ringing whenever a new keg is tapped in the Maritime Museum of Barcelona, so now ​​it feels like a good time to present the 2016 Activities Grid of the Barcelona Beer Festival. With a selection of 300 plus different beers during the whole weekend, one has to find key moments to pause on the road. Our offer of parallel activities can help this break to also be educational. And delicious! "We want every Activities' attendee to leave each lecture having learned something new"
As every year, we have lots of new offering. Many new faces, as well as some well-known people, will perform presentations and workshops on very diverse topics, with an overall focus that actively seeks that each of the attendees leaves the activity having learned something new. Indeed, as we already achieved in the previous year, on this fifth edition we wanted to promote exchange and learning. Without further ado, we proceed to present the different activities scheduled for this year, divided into blocks according to their content and / or purpose. Just below these lines you can find the cheatsheet of all this parallel offer, in image format so that everyone can download it and comfortably check it from any mobile device. At Com degustar cervesa, Editorial Omega presents the Spanish translation of the book "Beer Tasting" (Cómo catar cerveza) by Randy Mosher, a reference manual for many beer lovers, with complete information on how to assess this product step by step. Pablo Vijande (MasMalta.com) runs a tasting of 3 varieties of beer, correspondingly paired, following the pattern of this essential work. We therefore acknowledge the feedback given by visitors, who asked for more introductory activities. This year, the BBF proposes at Cervesa Americana a Europa a breaking discussion on the progressive landing of American Craft Breweries to Europe. For this occasion, we have the presence of representatives of the American Brewers Association, as well as Stone Brewing, Founders, Edge Brewing and the direction of the Vermont Brewers Festival. Delicious American beer will of course be sampled during the session, in this updated version of our BBF Round table! It is now four editions that we have been releasing our limited edition pack of beers, representing each of them one of the 4 main ingredients (Water, Malt, Hops, Yeast). This year we present them in this activity to introduce the new Pack BBF, in a Live-Blogging format, with the presence of brewers La Pirata, Quer, As and Edge Brewing. For 1 hour, eight different beers are tasted: 4 from the Pack, and 4 more, one of each of the collaborating brewers. 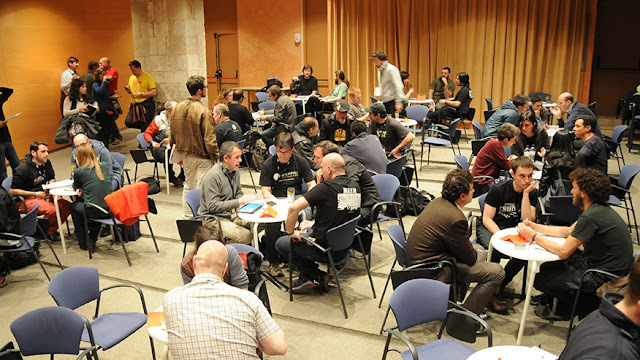 Participants make use of social networks to convey their feelings with the beers, and their exchanged views and conversations with the brewers. Thanks to our twinning with the festival Bières et Saveurs de Chambly, we have the opportunity to learn about the beer scene in Québec and Canada. 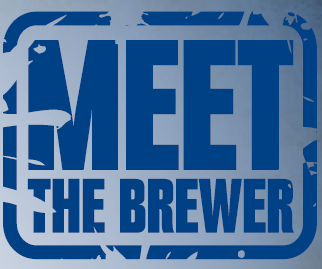 Claude Demers, director of the festival of Chambly, and Jean Gadoua, brewer at the prestigious Farnham Ales & Lagers, will introduce us to this singular beer scene while we try some of their best beers. 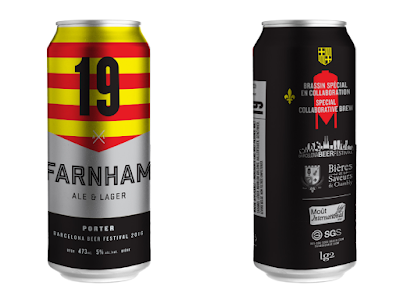 To those who are intrigued, yes, Farnham La Catalane, limited BBF edition cans will be sampled during the session. "Last year it was Garrett, who's coming in 2016?" I don't know how many times I have been asked this question during the last months, but I guess the answer is here. This year we are proud to receive a visit from one of the great names of the international beer scene: Mikkel Borg Bjergsø, better known by the name of its beers: Mikkeller. In Gypsy Brewing amb Mikkeller he will tell us first hand the "Mikkeller model" as a beer business, discussing the role of gypsy brewers in the brewing industry. We will of course sample some of his creations. ¿Is there something missing? To continue increasing the importance of our plaza as a complementary space for the Festival, this year we present an outdoor activity in which participation is spontaneous by the public who comes to the festival with an open mind and willing to dance Swing! Noe and Ian run a dance session for beginners in Beer & Swing, telling the origin of Swing, teaching the basic steps, the connection with the dancing partner and the great pairing between Swing and beer! Come and enjoy it! Year after year, our visitors show their enthusiasm for those activities combining beer and food, showing the great virtues of our favorite drink in the accompaniment of and endless range of culinary creations. But gastronomy is not only about cuisine, and it is in this sense that the gastronomic part of the activities has been planned for the BBF 2016. We have 5 different offers to delight the palates of the most demanding gourmands, of the lovers of sensory challenges and of those who like haute cuisine, without forgetting those seeking a more interactive experience in the pairing of these two elements. At Leuven: The Place to Beer, Erik Coene will lead an activity that will take us to Leuven, a true paradise for many beer lovers. In this activity, in a Live-Blogging format, two renowned brewers such as Hof ten Doormal and Den Triest will guide us in a tasting of local beers, pairing it with some Flemish gastronomic delices. Participants will use social networks to transmit their experience.dirigirá una actividad que nos llevará a Lovaina, el paraíso para muchos amantes de la cerveza. A very interesting workshop is brought by our colleagues at Gatgraz, with whom we will explore in Picant! the theory and practice of applying spice to beer: its use in the United States and Europe, and the different types of chilies used in brewing (Chipotle, Jalapeno, Habanero , etc.). The practical part will involve a fantastic menu of different tapas with chili, paired with delicious spicy beer, brewed with jalapeños. Another activity that makes us proud is brought by renowned brewers Nøgne, from Norway, who land in Barcelona with one of its most innovative production lines in Europe: Sake! At Sake amb Nøgne they will explain us firsthand what's this drink of oriental origin: its difference with beer, and what makes it so similar as a product at the same time. 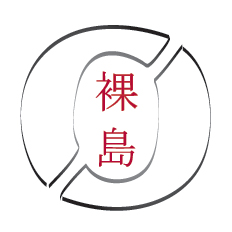 A tasting of different varieties of Sake to appreciate the differences will be performed. Can you think of an unmissable event at BBF Gastronomy? Indeed: five years of Festival; five years with our colleagues from El Raco d'en Cesc, a restaurant in the Eixample district that enhances his impeccable culinary offer with a stunning and pioneering beer offer. Sommelier Edgar Rodriguez and chef Toni Romero prepare us a new session of haute cuisine and beer, for the most discerning palates. Last but not least, another veteran participant in our activities programme. Third year in a row with David Moya and his Maridatge Sensorial 3.0. 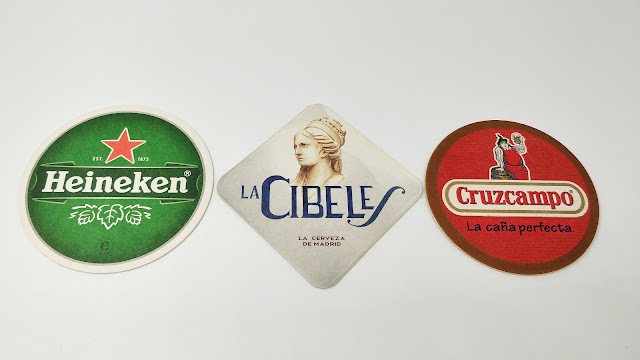 From 4 Pedres, a pub in the neighbouring city of Badalona, David has prepared a music and beer matching session, playing with our senses to demonstrate how external stimulus can affect our perception of gastronomic products. A stunning activity: 2 hours to change our previous idea about beer tasting. 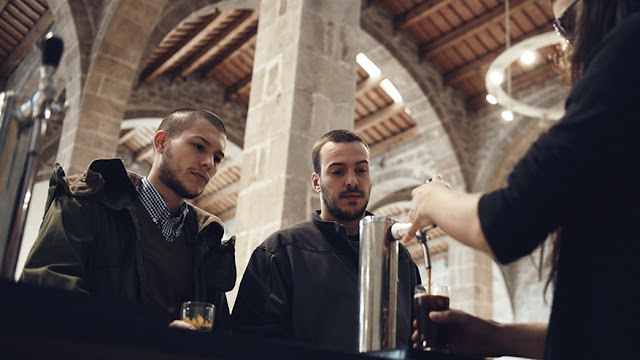 Once again, the Barcelona Beer Festival creates a specific offer for its professional public, improving its contents year by year thanks to the feedback we receive. It is not our call to say wheter we willsucceed or not, but this year we are delighted to offer the Tecnical Conferences, combining as in the previous edition both lectures and networking sessions. 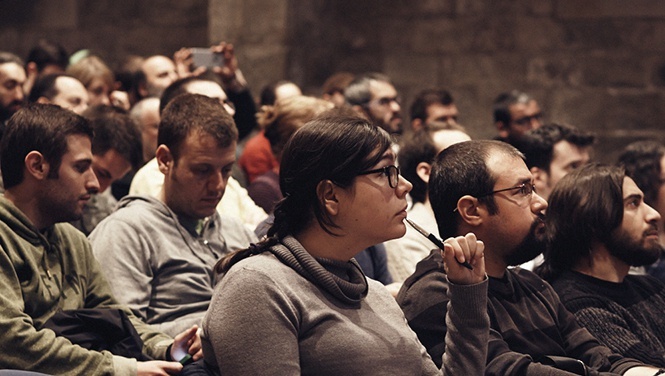 As for Lectures, on Friday morning the opening of the Festival will be led by the directors of the Barcelona Beer Festival, accompanied by a representative of the the administration of our country. Then, all accredited professionals will enjoy a series of short and dynamic presentations with varied content: raw materials, storage, machinery, etc. The Networking events were a pilot last year, and a very successful one! Hence, this year we strengthened this part to promote a further exchange of ideas, knowledge and contacts. To do so, we will enable an area for industry professionals to meet and know each other, in addition to organising a three-hour session of Speed Meetings on Friday afternoon. 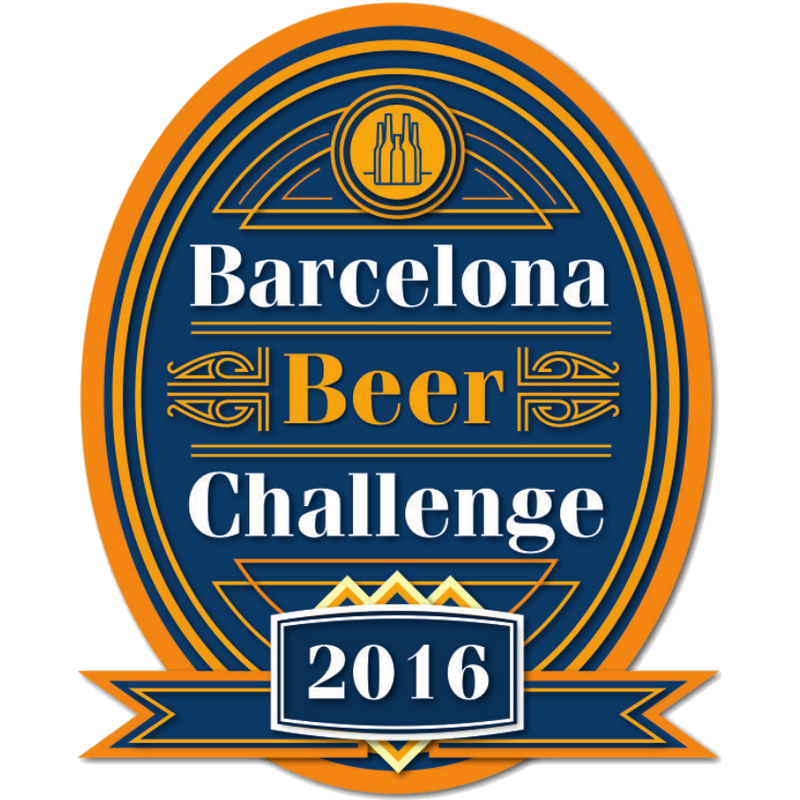 One of the moments we are looking forward to the most will be very close to the end of the Festival: the awards ceremony of the Barcelona Beer Challenge 2016, freely accessible to anyone who wants to attend. A reading of the results by the Steering Committee will be held, disclosing figures and the final competition results, while doing honor to the winners of the contest. Do not miss the final party with the winners! 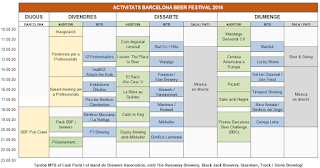 After a fantastic reception in its second year, we repeat and happily extend the MTB experience with a renewed list of international brewers who will have their own stand on a rotating basis throughout the weekend of the Barcelona Beer Festival. This year we will be joined on Friday by the brewers of 12 Fermentadors (Barcelona), a local initiative that is worth knowing, while the team behind ImpliK2 will present their solidary beer Attack the Krab, which allocates a portion of its revenue to the fight against cancer. Additionally, the following brewers will join us on our first day: Eskilistuna Ölkultur (Sweden), Piccolo Birrificio Clandestino (Italy), Birrificio Mezzavia (Italy), La Buttiga (Italy) y P3 Brewing (Italy). On Saturday we have Bad Co (England), Birrificio Hibu (Italy), Warpigs (Denmark), Fourpure (England), Elav Brewery (Italy), Brewski (Sweden), Vandestreek (Netherlands), Maximus (Netherlands), Redwell (England), Mikkeller (Denmark) and Birrificio Lambrate (Italy). Closing the Festival, on Sunday our MTB brewers will be Marduk (Italy), Lucky Brews (Italy), Hof ten Dormaal (Flanders), Den Triest (Flanders), Tempest Brewing (Scotland), Birra Amiata (Italy), Birrificio del Doge (Italy) and Cerveja Letra (Portugal). Moreover, a fixed Brewers Association stand will be installed the whole weekend, and some of the guys from Stone Brewing -and maybe some others- will be there on occasion. 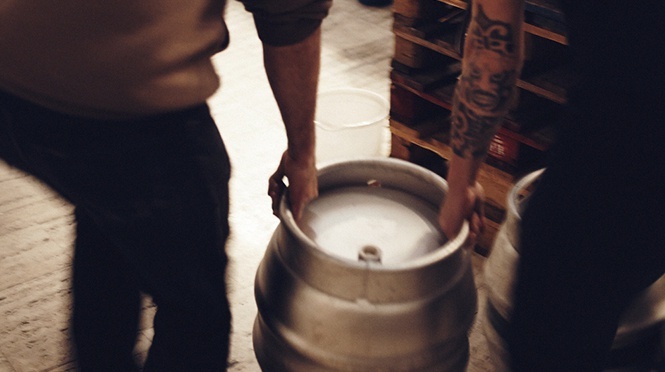 Our Cask Corner, with an offering of British beers on cask, will also be joined by the brewers at The Runaway Brewery, Black Jack Brewery, Quantum and Track. We are pleased to announce that this year we were able to reduce prices for some activities, so that except on those with free entrance, the price ranges from 1 € to 10 €. We are convinced, though, that each of the activities scheduled has a much greater value than the cost of admission, which in itself is very small thanks to the synergies caused by the availability of a well-equipped Auditorium the dimensions of the Festival. 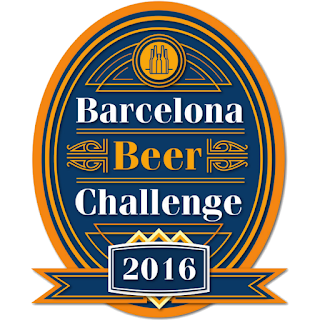 It is not necessary to book tickets for Beer & Swing, nor for the awards ceremony of the Barcelona Beer Challenge. Both activities are open to the public in their specific schedules. Moreover, the links to join the professional conferences will be sent individually by email to the different professionals invited. 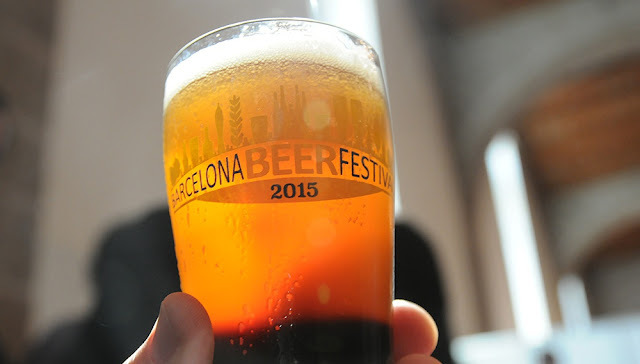 And that was the presentation post of the Barcelona Beer Festival 2016 parallel activities. We hope you find them interesting and that you can enjoy them as much as the 300 plus beers that will be on tap in our bar during the weekend of March 4th to 6th 2016, in the Maritime Museum of Barcelona.